Goats are ruminant animals, along with sheep, cows and deer, which means that they belong to the ‘cud chewing’ group of animals. They digest a large amount of roughage which contains a high degree of cellulose. Cellulose is an essential source of energy for animals, including non-ruminants. It is found in green plants and grasses and is digested by the bacteria found in the gut, not by the animal itself. This process begins in the rumen and is continued throughout the digestive tract. The presence of ‘good’ bacteria is essential to the health of the goat. Relatively large amounts of roughage are required to satisfy the needs of goats. In their natural state they would cover quite a large area, continually on the move seeking out new sources of forage and converting it relatively quickly into energy via gut bacteria. Part of this process includes resting periods when the rumen content is regurgitated back into the mouth and the contents mixed with saliva before being swallowed again (chewing the cud). Perpetual movement is not feasible for our domestic animals and therefore an adequate and appropriate supply must be provided for them by their keeper. The goats’ digestive system consists of four compartments which, in addition to contributing to the further digestion of food intake, also manufacture their own particular nutrients. Rumen The rumen, or first stomach, is the largest of the chambers and represents about 80% of the stomach area. It has a large population of micro-bacteria which break down the plant cell wall material, releasing the available nutrients. It is constantly active, mixing the food and saliva together, acting as a sort of vat. It converts the cellulose into fatty acids, absorbing them through the wall of the rumen, thus providing most of the animal’s energy requirements. To a certain extent, vitamin K and the B vitamins are additionally manufactured by the micro organisms of the rumen. The micro organisms’ balance in the rumen is somewhat delicate and should not be disrupted. Reticulum This second stomach is strictly speaking part of the rumen, sitting as it does just below the entrance of the oesophagus. It serves to protect the fourth stomach, which is delicate in nature, from any hard matter such small stones that might be ingested. 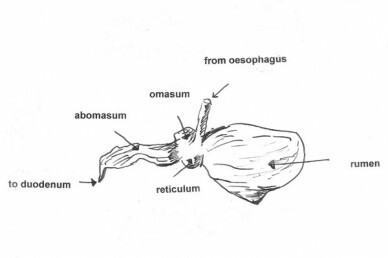 Omasum The third stomach or omasum serves mainly as an absorbent area that dries out the content of the rumen as it passes through its leaf-like structure. Abomasum This is called the true stomach and is equivalent to the stomach of single stomached creatures such as horses dogs or cats. The normal gastric enzymes in the abomasum break down the food further, with the passage of food through the gut facilitating the secretion of bile and pancreatic juices, aiding continued digestion. During rumen digestion, methane gas is produced which is expelled regularly by belching. An accumulation of gas can result in a condition known as bloat which should always be dealt with promptly.